My family of 5 (2 adults and 3 kids aged 8, 6 and 2) will be visiting HK from 12-16 Dec 2011. We arrive in HK at 11.35am and depart at 12:05pm. The hotel that we are staying at is Holiday Inn Golden Mile in Tsim Sha Tsui. Can you please recommend an itinerary that is suitable for young kids? As my kids are pretty young, the itinerary should be relaxing (not rushed) and we need to end the day by 8.30pm. Places that we want to visit are Disneyland, Ocean Park, The Peak and Symphony of Lights (preferably on the Star Ferry). Also, could you recommend a shopping area where we can get a great variety of affordable children's wear please? Is Stanley market a good place for this? It is quite far and inconvenient so I may skip it if it is not worth the hassle. What other attractions will you suggest for us? In your suggested itinerary, can you please also include the best way to get to those places, considering we have 3 young kids in tow? Will be in HK in March 28-april 1 2013. With my mom, sister and niece we'll be arriving around 7pm and departs also around 7pm.. We'll be staying at cosmo hotel mongkok what itinerary can you rcommend for us? *Ocean Park requires a full day event but you may stay there until late afternoon. You may spend the rest of the night shopping at Causeway Bay, just 2 stations away from Admiralty station. Thank you very much for your suggested itinerary! December 12 Monday: Since the Symphony of Lights is around dinner time, where would you recommend to have dinner and the spectacular view at the same time? As we will be visiting Victoria Peak which is on HK Island, on Dec 14, can we take the star ferry there instead? Then we don't take it on Dec 12. So far, all the direction from Tsim Sha Tsui to Victoria Peak is via Admiralty MTR so I am curious if we can go via the ferry instead. December 13 Tuesday: Full day at Disneyland. December 14 Wednesday: I don't think we can do museums on the last day as our flight is at 12pm, meaning we should leave for the airport about 9am? So I am thinking that we should probably visit them on Dec 14 instead. That day's schedule seems pretty light anyway. So maybe museums in the day, followed by Victoria Peak in the evening and maybe have dinner up there. Heard that the night view is more breathtaking! As for shopping, which place is the best for children's clothing at a bargain? December 15 Thursday: Do we need a full day at Ocean Park? If we leave at about 5pm, is there anything else in that area that we could visit? Or anywhere along the route back to the hotel? December 16 Friday: Have a sumptous breakfast before checking out and heading to airport! Here is my personal itinerary suggestion for your family with kids. Holiday Inn Golden Mile is situated at 50 Nathan Rd, Tsim Sha Tsui, Kowloon, Hong Kong. December 12,Monday: Avenue of Stars and watch the Symphony of Lights at 8pm. I suggest you walk along the promenade during daytime and night time to view Hong Kong on both times. You may want to cross the harbour riding the Star Ferry going to Central and vice versa. *It's a 6-minute walk from your hotel going to the Avenue of Stars. Just follow directional signs. December 13, Tuesday: Hong Kong Disneyland. Don't miss the "Disney and the Stars" fireworks at 8pm. *Getting to Hong Kong Disneyland from Tsim Sha Tsui. 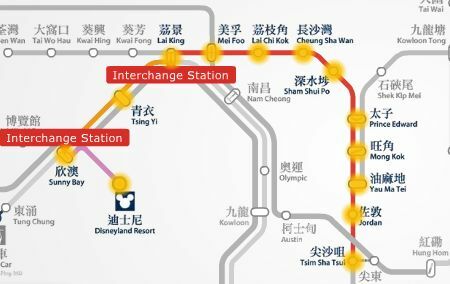 Just get into the Tsim Sha Tsui MTR station--> take the Tsuen Wan Line train going to Tsuen Wan and Interchange trains at Lai King station, take the Tung Chung Line and get off at Sunny Bay station--> interchange trains, take the Disneyland Resort Line to Disneyland station (38 minutes @ HK$17). December 14, Wednesday: Victoria Peak. (Sky Terraces then pop into Madame Tussauds). Then, shop at the Ladies Night Market in Mongkok. * Getting to Victoria Peak: Please click here. * Getting to Mongkok from Victoria Peak, get back to Central Station and take MTR trains to Mongkok Station. Take Exit D3 and follow directional signs. December 15, Thursday: Hong Kong Ocean Park. * Getting to Ocean Park: Take the MTR train station at Tsim Sha Tsui Station, Entrance/Exit G or N5, look for the Tsuen Wan Line trains heading towards Central but you need to get off at the next station from Tsim Sha Tsui which is the Admiralty station. Only 5 minutes train travel, HK$ 8.1. December 16, Friday: Visit to the Hong Kong Museums specially those that are located in Tsim Sha Tsui area, please click here to read details. I suggest you go to the Science Museum first. *I think the kids won't appreciate Stanley Market. Hope this helps and have a wonderful stay in the City of Life.